James Gordon and his two brothers came to Chickamauga, then known as Crawfish Springs, from Gwinnett County in 1836. In 1840, James began construction of this home (employing slave labor and using bricks made on site) to serve as the centerpiece of his 2500-acre plantation. The site was of local importance, as the Cherokee Courthouse was located on the grounds prior to displacement. [It was originally executed in the Greek Revival style; the addition of the massive portico and entablature in a 1900 remodel gave it its present Neoclassical appearance]. Gordon’s son Clark was elected commanding officer of Company D, First Georgia Volunteer Infantry, organized in 1862. During the Battle of Chickamauga the home served as temporary headquarters of Union Major General William Rosecrans, Army of the Cumberland (16-19 September 1863). 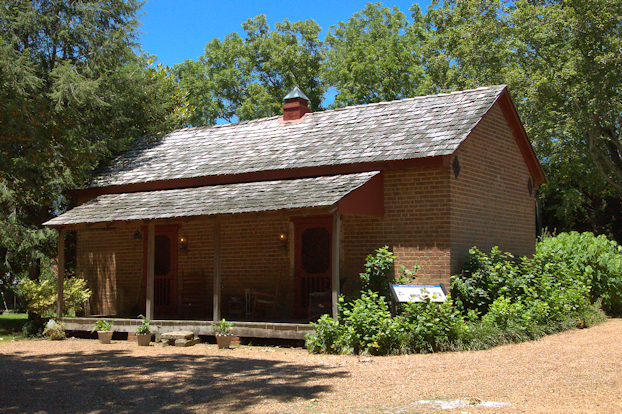 It also served as a field hospital (18-20 September 1863) under the command of Medical Surgeon R. G. Bogue, treating both Union and Confederate casualties. In 1889, 14,000 veterans of the battle held a reunion on the grounds known as the Blue-Gray Barbeque. The idea to establish the Chickamauga-Chattanooga National Military Park had its origins at the barbeque, significantly the first Civil War park in the United States to be protected through preservation. Upon the death of James and Sarah Gordon, the home passed to their daughter, Elizabeth, and her husband, James Lee. The next owner was their son, Gordon Lee, a United States Congressman (1904-1927), and his wife, Olive. Lee stipulated in his will that if no family member took on the property for twenty years that it would become the property of the City of Chickamauga and this happened in 1947. It was sold to Dr. Frank Green in 1974. Dr. Green restored the house and grounds with great attention to historical accuracy. In 2007 it was purchased by the City of Chickamauga, which now operates a museum on the site. This saddlebag house is the last surviving of six slave dwellings on the property. Even if you don’t have the time to visit all the Civil War sites in the area, take the time to walk the wonderful grounds of the Gordon-Lee Mansion. 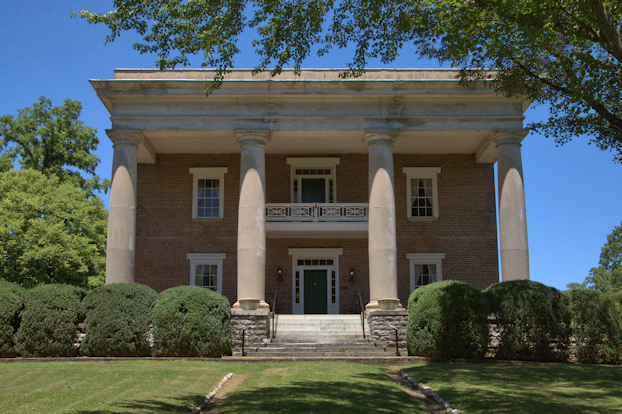 Operated by the Friends of the Gordon-Lee Mansion in conjunction with the City of Chickamauga, it’s a wonderful green space and historic site. The Bowen-Jewell Bag Company first opened a bleachery across from the Central of Georgia Depot in 1909. 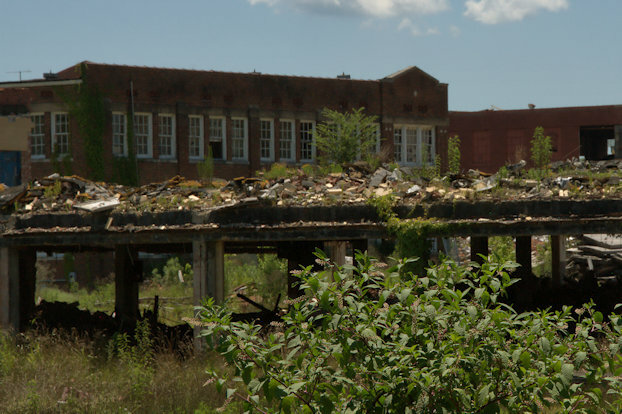 A cotton mill was added in 1914 and the business was incorporated as the Crystal Springs Bleachery Company. 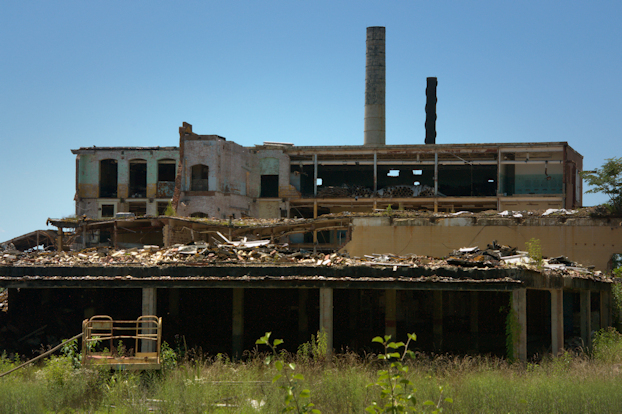 A larger more modern bleachery was constructed in 1923, making the facility one of the largest employers in the region. The main product of the bleachery was printed cotton fabric, primarily in the form of bags. Dan River Mills purchased the business in 1969 and by 1976 had a peak employment of 1200. Downsizing began in 1977 and by 1982, Dan River announced plans to close the facility. 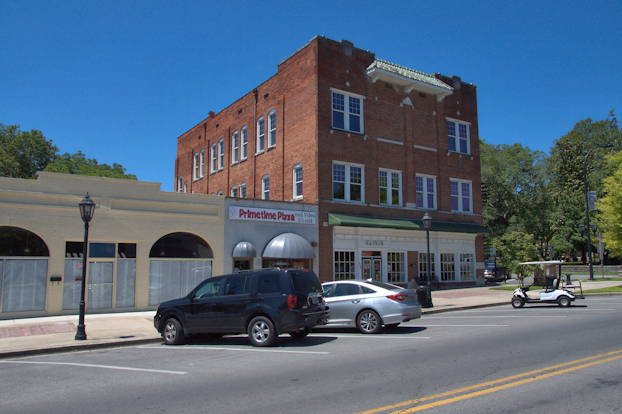 In February 1983, former Chickamauga mayor Frank Pierce, Steve Tarvin and Stanley Cunningham purchased the business and saved about 200 jobs. Downsizing continued over the following decades and the business, by now known as the Crystal Springs Print Works, was shuttered in 2013. Even with a reputation as one of the best printers in the business, Crystal Springs is emblematic of the loss of U. S. textile business to China; whether that’s the fault of bureaucratic regulation or cheaper labor remains a topic of debate. Having grown up in a town with hundreds of textile jobs myself, the reason isn’t as important as the loss of a way of life. Chickamauga was unusual in that local investors did their best to keep it afloat, and that deserves some recognition. The property was sold to a recovery company, which is slowly removing the valuable heart pine floors and other framework, handmade bricks, and salvageable historic fixtures and metal. A residential community is planned for the site in the future. Organized in 1874 as the Chickamauga Methodist Church, this congregation, like many, met in a brush arbor for a time before erecting a combination church/lodge building, which served them until the present church (right in photo) was constructed between 1913-1915, during the pastorate of C. A. Hall. W. H. Sears, a prominent Chattanooga architect was responsible for the design. 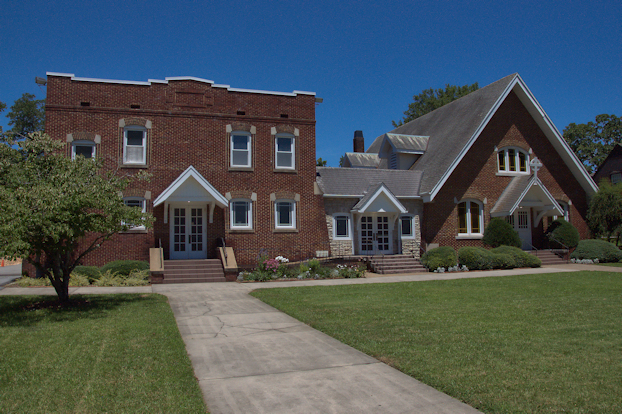 The Sunday School building (left in photo) was constructed in 1929. I’m not sure when the church name was changed to honor Mrs. Lee. 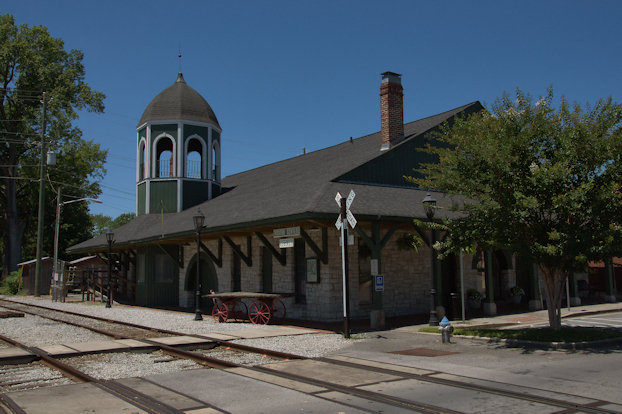 After having fallen into disrepair for many years, including the loss of its tower, this depot was recently restored and is now home to the Walker County Regional Heritage and Train Museum. 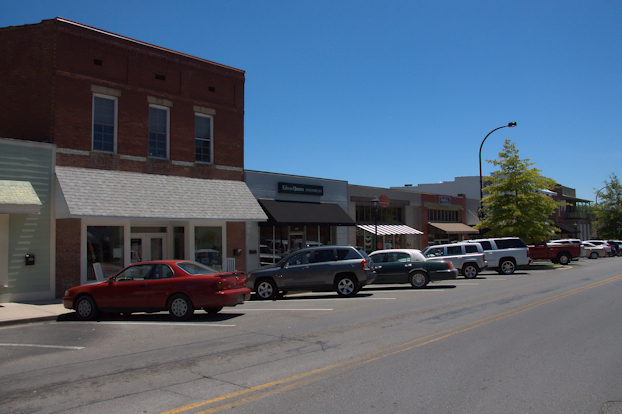 Downtown Chickamauga is a busy place and I was only there for a few minutes on my recent trip. I can’t wait to get back and explore more of this wonderful town. This was built by the Chickamauga lodge in 1926 but has had commercial tenants over the years. From the historical marker placed in 2010 by the Walker County African-American Historical & Alumni Association: Chickamauga Prince Hall Lodge No. 221 Free & Accepted Masons of Georgia; First Charter 1915; Second Charter June 11, 1926. Present building completed in 1924, rededication 1952. Organized by once enslaved and and first generation freed African Americans. During segregation, in Walker County’s African American communities, Masons are active in the building & support of schools, churches, needy children & widows, laying cornerstones, funeral rites, burial insurance & social events. 1915 Charter: Rev. Kendall, Worshipful Master; C. D. Haslerig, Sr. Warden; C. S. Shellman, Jr. Warden; Archie Haslerig, Sec. ; Sam Dodson, Treas. ; John Daniel, Tyler. Worshipful Masters: C. D. Haslerig, C. W. Haslerig, W. A. Haslerig, Joseph McGinitis, Louis Moss, Raymond Smith, Bill Madden, Ray Hinton, Moses Cleveland, Lafayette Daniel, Joseph T. Suttle, Sam Mitchell, David Myers & Eddie W. Foster, Sr.
Chickamauga Ester Chapter 476 Order of Eastern Star. Charter granted June 28, 1944: Odessa Haslerig, Worthy Matron; Raymond Smith, Worthy Patron; Rugh Jones, Associate Matron; Sally Shropshire, Secretary. 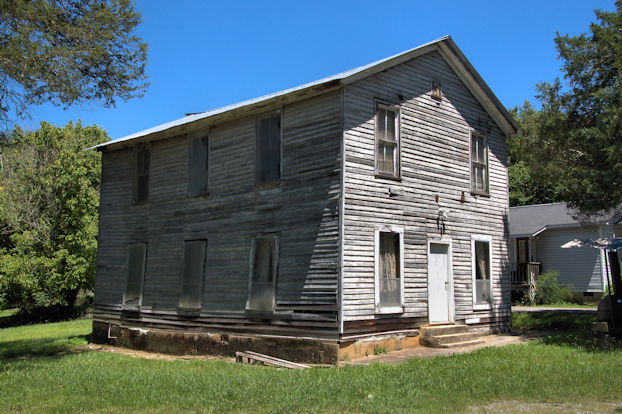 The Walker County African-American VFW held its charter meeting here in the 1940s and the lodge was home to the organization for a time.